264 pages | 57 B/W Illus. Although much has been written about the Korean public administration, the international academic community has little knowledge about it as most of the literature has been written in Korean. This book aims to provide more accessible knowledge internationally by filling that gap, covering both the history and the current status of the Korean public administration. This book is a collaboration of many Korean public administration scholars and would appeal to those interested in the secrets of Korea’s rapid development in such a short span of time. 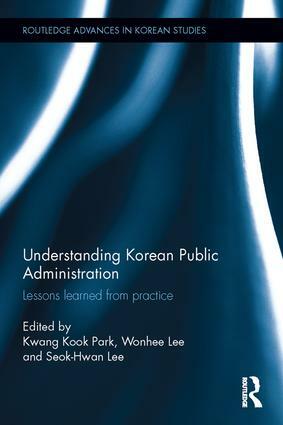 Each chapter covers historical contexts, key to understanding its public administration and an important aspect as Korea is a fast changing society. The book takes on a more pragmatic approach rather than to put the Korean experiences into the western theory. Each chapter therefore provides an extensive discussion on the lessons-learned and practical implications. Kwang-Kook Park is Professor at the Department of Public Administration, the Catholic University of Korea. His research focuses on organizational theory, government innovation, and cultural policy. He served as the President of the Korean Association of Public Administration in 2013. He has been the President of Korea Environment Institute since 2014. He has published numerous articles that have appeared in the International Review of Public Administration, the Korean Public Administration Review, the Korean Policy Studies Review, and others. Wonhee Lee is Professor of Public Administration and Public Policy at Hankyong National University and also Executive Director at the Research Center on State Owned Enterprise, Korea Institute of Public Finance. Seok-Hwan Lee is Dean of the Graduate School of Public Administration and Professor of Public Administration and Public Policy at Kookmin University, Seoul, Korea where he specializes in public performance measurements and management.